Then: Karen Pendleton (in the bottom middle row, to the right of Annette Funicello) came to The Mickey Mouse Club at 8 years old having never even been on a Hollywood set. She was often paired onscreen with the equally small, cute, and young Cubby O’Brien. She often made mistakes on camera due to her lack of experience — a quality producers loved to play up to make her relatable to fans — and she was continuously baffled by her own fame. But she and Cubby were an indelible TV “couple”: “I even heard that we got the most mail aside from Annette,” she says. “There were a lot of little kids who liked watching us together.” The duo, however, declined a joint contract offer from Disney at the end of the show’s run. “I can’t imagine how my life would’ve been different if I’d done it,” she says. 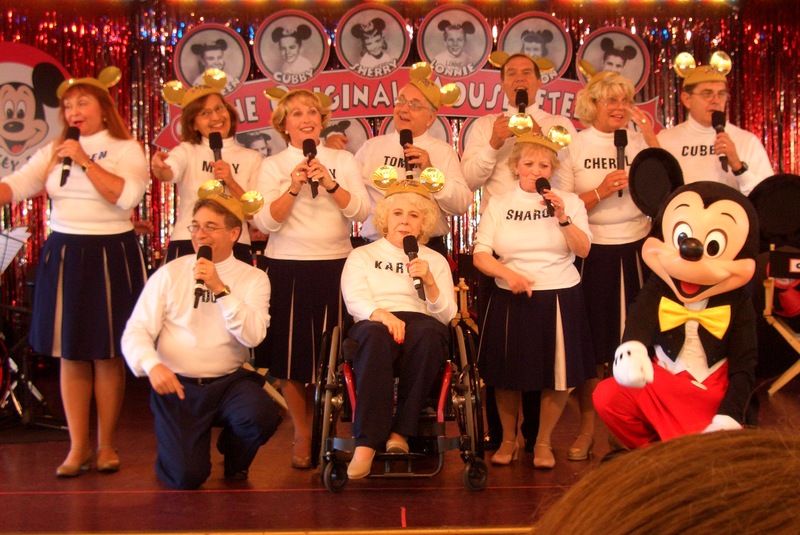 Now: Karen (seen here at the 50th reunion performance, front and center) dropped out of performing when she found auditions made her nervous. After moving to Fresno, she suffered a car crash in 1983 that injured her spinal cord and left her paraplegic, putting her in a wheelchair most of the time. The accident fueled her determination, however, and she finished both her bachelor’s and master’s degrees in psychology while also raising her daughter as a single mom. She worked at a battered women’s shelter, then at the Center for Independent Living in Fresno, where she still lives. THIS IS A SPECIAL “HELLO” TO KAREN PENDLETON. PICTURE MYSELF JITTERBUGGING WITH YOU. You were my favorite Mouseketeer. I am a year younger than you, and used to be rather shy. I saw a quiet, cute personality in you, and daydreamed of being with you, like 9 year old’s do. I looked forward to seeing you every day on the TV. I lived in Saginaw, Michigan. We had an old black and white TV that worked MOST of the time! I was sorry to hear of your car accident, but amazed that you got your Master’s degree. I graduated from Western Michigan University, and served 2 years in the U.S. Army, one year in Germany (1971). I suffered a stroke in 2008, leaving my left side paralyzed, but I have adjusted to one-handed life. Life goes on, and we must make the most of it! God bless you. You’ll always be “KAREN in the Mickey Mouse ears” to me! I HAVE YOU BOOKMARKED FOR A FREQUENT PICK-ME-UP. I was sorting out”stuff”tonight and came across autograph books from long ago and memories flooded in and your name was there…. and how well I remember. We met at the Sydney Stadium and I’d won the prize of being your Australian Secretary, along with another child if I recall events correctly. I remember telling you I was 11 1/2 and now I tell people I’m just over 60! I was sorry to read of your car accident but was interested to read the commonalities between we “girls” as we say in Oz land. I also did a Degree Course and later a Masters in School Counselling. Now I work approximately 3 days a week in NSW schools and cannot imagine retiring “full time”….love the kids, love the social contact. 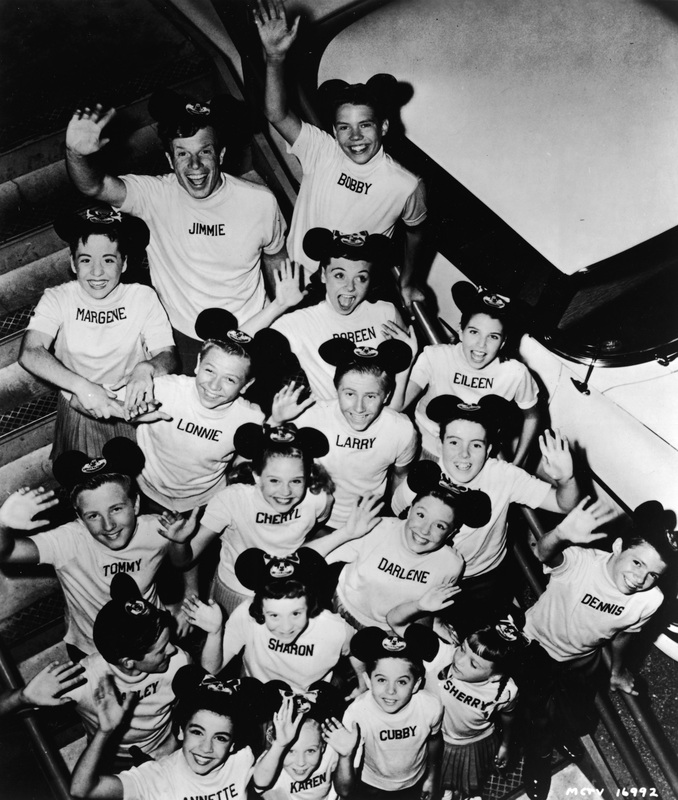 Most importantly, thanks for all those wonderful Mouseketeers days of my childhood – I hope Walt treated you well. Hello Karen. I thought of you today, out of the blue and decided to find out whatever happended to you. When I was a child, I watched the Club every day. You and cubby were my favorite. So much so, that when I was in kindergarten, my mom gave birth to my sister and allowed me to name her. Guess what is her name? Yes – Karen. I named her after YOU. Although when I told my sister a couple of years ago, she replied “You named me after a mousekateer?? Thanks! !” but then, Karen didn’t watch the mousekateer club. Your program was so much my favorite that when I was in the hospital to have my tonsils removed, my grandmother came to me in the hall of the hospital and presented me with a Minnie Mouse Doll – soft body with a hard plastic face. I was sorry to read about your accident but you are truly a wonderful person – just like the lady named after you. May God bless you always. I hope you receive this note. Hello Karen, I recently found out from my dad that I got my name from you, he said that he remembers watching you and thinkning he really liked the name, so I looked you up on-line what an adorable little girl you were. I read that you got your masters in psycholgy, which I too am working on. Blessings and joy to you. Karen, This will go back to your high school day’s. I hope you can fill in the mental blocks. You and a close friend, Mike (can’t remember his last name) double dated. We double dated alot and had a great time. I wish I had more descriptions. I do remember Mike had an Italian last name and a great laugh. My name is John Olson (two years older) than you and Mike. You guys made a fun couple. I hope you can fill in the mental blocks! You were my favorite mouseketeer! We were the same age, and I thought you were perfect and so likeable. I wish you were still on TV! You were my favorite and I was a true 6 year old fan. I even changed my name telling everyone to call me Karen. We met in Oklahoma when your aunt and my mother struck up a conversation while waiting in the airport. I later went to your home when we moved to California. It was a dream come true, and my Dad took home movies capturing your performance in the middle of a wind storm, and then us at your house. Karen you were my counselor at Hoover High School back in like 1999. You changed my life and I will never forget that. You are truly a wonderful person. If it wasnt for you I would have given up on everything. I would love to get in contact with you again. You were my favorite of all. I had such an indelible crush on you as a child of your same age, I was even jealous of Cubby. LOL. I can’t tell you what a joy it was for you to inhabit my imagination. God bless you. Karen, I will be 71 next month. I named my doll Karen after you and my four granddaughters still play with her. I tell them I named her after you . My mother bought her at Sears North Hollywood because I wanted the cryby doll (Cry baby doll) because she surely needed a home. I had to hide her under my bed when friends came over because I was way too old to have a doll. She has had a makeover and remains in the same crib she came home in. Hope you are well. I recently saw a group picture of the MouseKeteers and immediately recognized your picture. It’s been 60 years since I saw the MMC and remember being so in love with the ‘older girl’ (You were 9, I was 7 at the time). Anyway, it is surprising to me that a 7 year old could be so smitten, but I was and just wanted to tell you a little story. At the end of each episode I used to pick you off the TV screen and put you in my shirt pocket. I’d keep my hand cupped over you. When my mother asked if my chest hurt, I said I didn’t want Karen to get squished. She told me I was being really silly, but I wouldn’t remove my hand. Just wanted you to know, as I’m sure you already do, that a million kids adored you… and one more — me. Thanks for the good memories.